Germany Reassures Ireland Over Brexit Border Impasse - Integration Through Media ....! 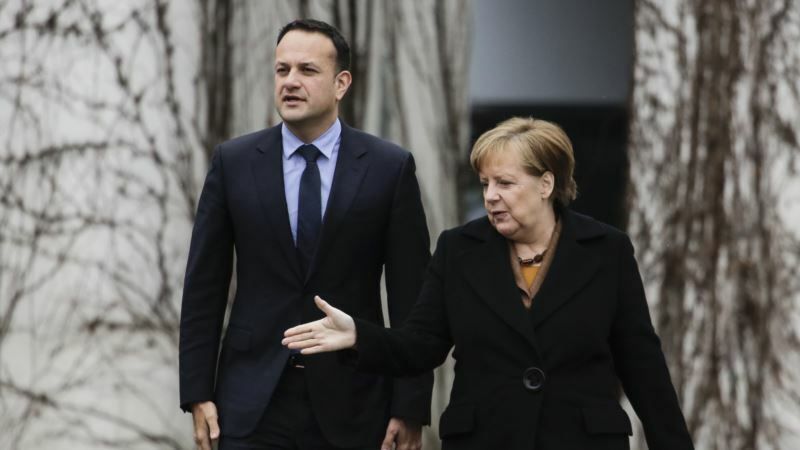 (VOA): German Chancellor Angela Merkel on Tuesday reassured Ireland that it can rely on Germany in Brexit talks as the European Union and Britain struggle to find a way to maintain an open Irish border after the U.K. leaves. Merkel met with Irish Prime Minister Leo Varadkar in Berlin a day after EU and British negotiators said there had been no breakthrough on the Irish border issue, despite announcing progress on the outlines of a transition deal after Brexit day in a little more than a year's time. “A solution must be found for this … and Germany fully supports the Irish position,” Merkel said. Britain is due to leave the 28-nation EU in a little over a year, and how to keep open the all-but-invisible border between EU member state Ireland and Northern Ireland, which is part of the U.K., is proving one of the biggest headaches. He called for “more detailed written proposals” from British Prime Minister Theresa May’s government that can be made legally binding. If London proposes “something that is very close to a customs union, then I think that would solve a lot of the problems related to the Irish border, but if it's something much less and much weaker than that, then it would not,” he added. Varadkar said that “nothing is agreed until everything is agreed” and that he’s reassured by the depth of support from Germany, the EU’s most populous country. “Ireland can rely on us,” Merkel said. In Brussels, European Council President Donald Tusk was upbeat about over all progress on Brexit before chairing a two-day summit starting Thursday. “We have achieved success” on defending the rights of citizens hit hardest by Britain’s departure and the divorce bill that May’s government must pay, Tusk wrote in an invitation letter to the leaders. Britain leaves the EU — the first country ever to do so — on March 29, 2019, but any Brexit deal must be sealed by October or November to leave sufficient time for parliaments to ratify it. A draft text of guidelines for negotiating future ties between the two — seen Tuesday by The Associated Press — warns starkly of the impact that May’s decision to leave Europe’s single market and customs union will have on any future trade agreement. “Divergence in external tariffs and internal rules as well as absence of common institutions and a shared legal system, necessitates checks and controls to uphold the integrity of the EU single market as well as of the U.K. market,” said the text, to be adopted at the summit. “This unfortunately will have negative economic consequences, in particular in the United Kingdom,” said the document, which is a draft and could change. On Monday, Britain’s Brexit envoy, David Davis, talked up the future of EU-British trade relations, saying that would start from the solid base of similar rules, standards and tariffs, even though no pact can start until after 2020. “This will be the biggest, most comprehensive, most effective trade deal ever,” Davis said. His EU counterpart, Michel Barnier, while satisfied with progress in recent days, warned Tuesday that much more remains to be done. “We’re not at the end of the road, going by the experience I have in negotiations and this one is unique. What lies at the end is often the most difficult,” Barnier said.